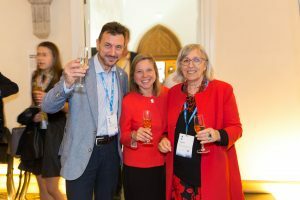 On July 12-14, 2017 the President of EAS, Prof. Laura Capranica participated in the Estonian EU Presidency Council Conference “Role of Sport Coaches in Society: Adding Value to Peoplea’s Lives” held in the capital city Tallin. On that occasion Prof. Capranica took the chance to have exchange with Roy Hodgson about dual career in the soccer sports world. For more information see here: (https://www.eu2017.ee/political-meetings/informal-meeting-eu-sport-directors-and-conference-role-sport-coaches-society). The conference addressed different aspects of coaches’ role, position as well as responsibility with respect to athletes and society, including the importance of coaches’ education, their qualifications and recognition. Conference ‘Role of sport coaches in society. Adding value to people’s lives’ (Tallin – EST, 13/07/2017 09:00 – 14/07/2017) under patronage of Education, Youth, Culture and Sports Council (EYCS) alongside the EU presidency of Estonia. The role of the coach in society is rapidly changing. Today, a coach is not merely viewed as teacher of proper technique but rather as a teacher of values and skills for life who is contributing significantly into society, by fostering personal growth as well as cohesion in society more broadly. In her keynote speech she highlighted the need of a coordinated international approach to enhance dual career opportunities for youth talented athletes. Furthermore in consideration of the European sport diplomacy, she invited the international participants of third countries to join EAS to exchange information, share best practices and collaboration international projects on dual career. 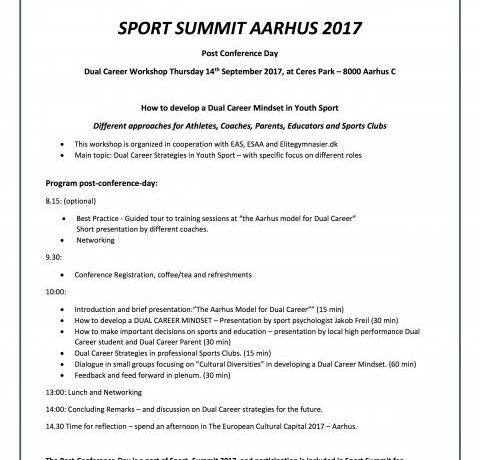 On Thursday, 14th September 2017 the “Dual Career Workshop” will take place at Ceres Park – 8000 Aarhus C. The workshop will be organized in cooperation of EAS, ESAA and Elitegymnasier.dk. Under the headline “How to develop a Dual Career Mindset in Youth Sport – Different approaches for Athletes, Coaches, Parents, Educators and Sports Clubs”, participants will discuss Dual Career Strategies in Youth Sport – with specific focus on different roles. Guided tour to training sessions at “the Aarhus model for Dual Career” Short presentation by different coaches. 14:00: Concluding Remarks – and discussion on Dual Career strategies for the future. 14.30 Time for reflection – spend an afternoon in The European Cultural Capital 2017 – Aarhus. If you want to participate in the Post-Conference Day – without participating in the SPORT-Summit 2017 – please send an email to ok@esaa.dk before September 1st 2017.